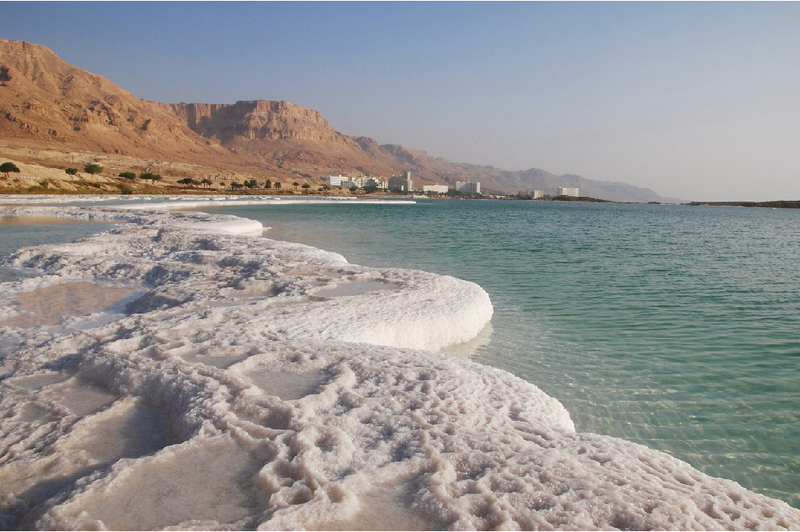 The weather conditions across the Red Sea and the Persian Gulf, as well as the northern Indian Ocean, as we will later discuss, alter significantly between the winter and summer months. 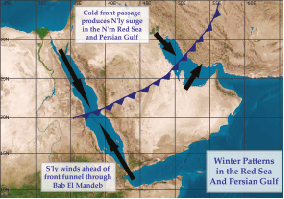 From late November through March, strong cold fronts track across the northern Red Sea and the Persian Gulf approximately every 3 days. Behind these cold fronts, cold air funnels or “channels” through the narrower waterways through the Gulf of Suez, and farther south into the Red Sea to approximately 18N, and finally across much of the Persian Gulf and into the Gulf of Oman. All of this occurs as a ridge of high pressure builds across northeastern Egypt and the Arabian Peninsula. As a result, enhanced north-northwest winds surge across the Gulf of Suez and the northern Red Sea of approximately Beaufort Force 5-7 and swells will build up to 8-12ft. Behind exceptionally strong cold fronts, winds will increase up to sustained gale force (Beaufort Force 8-9) particularly near the Gulf of Suez and swells will build up to 10-15ft. 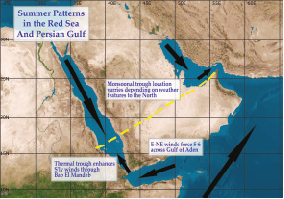 Average wintertime winds within the Persian Gulf are from NW, generally at speeds from force 3-5. Ahead of cold fronts, winds turn southerly and can increase to force 5-7. Winds then veer following frontal passages, with post-frontal passage NW winds of force 5-7 common. Winds as high as force 8-9 possible during the strongest NW wind surges (which are known locally as “Shamals”). The strongest of these winds tend to occur along the SW Iranian coast due to the funneling effects of the mountainous terrain of Iran itself. 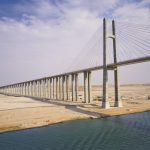 The winds then “wrap around” the southern coast of Iran and through the Strait of Hormuz, becoming westerly to southwesterly in nature in the western side of the strait, and returning to the original northwesterly direction as they exit the eastern side into the Gulf of Oman. Unlike what is found within Bab El Mandeb, the wider space within the Strait of Hormuz reduces the funneling effects and wind speeds within the strait often are fairly close to what is ongoing west of the strait. The ‘fetch” within the Persian Gulf is somewhat less than within the Red Sea, so seas tend to be slightly lower here during Shamal-related NW wind surges. Typical seas range 2-4ft in normal northwesterly winds. Ahead of fronts, short-period and “choppy” southerly 4-7ft seas occur near the northern end of the sea, and following frontal passages NW seas build to as high as 8-10ft in the southern sea with 10-13ft possible in the strongest surges. (see Figure 1A). 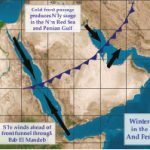 During April and May, and again in September through early November, the cold fronts are weaker and less frequent, tracking across the northern Red Sea and Persian Gulf about every 4-5 days, also tending to not push quite as far south. The ridge of high pressure that builds over the eastern Mediterranean is also weaker during the spring and autumn; and therefore the arctic air that funnels through these seas in the winter is moderated. Hence, the north-northwest wind surges occur less often and are weaker than their mid/late fall and wintertime counterparts. From May through early October, a thermal trough of low pressure generally develops from northern Sudan northeastward to the central Arabian Peninsula, and from there extends northeastward across the Strait of Hormuz and along southern Pakistan. This weather feature changes little in strength but does fluctuate its orientation during the summer. For instance, if the thermal trough is across the central Arabian Peninsula and a ridge of high pressure builds over the eastern Mediterranean Sea, then northwest winds will become enhanced from the Gulf of Suez southward to approximately 20N. These winds are generally in the range of Beaufort Force 4-6 (highest near the Gulf of Suez and lowest near 20N) and swells build to 6-10ft across this region. When the thermal trough shifts farther west over the Red Sea, then the northwest winds north of 15N ease and become variable of Beaufort Force 4 or less (see Figure 1B). However, with the thermal trough axis farther west, south-southeast winds also begin to funnel through Bab el Mandeb and surge northward to approximately 15N. Winds can reach up to Beaufort Force 7-8 through Bab el Mandeb, with the highest winds occurring during the late morning and afternoon hours, then become Beaufort Force 5-7 in the southern Red Sea with swells building up to 10-15ft (highest near the entrance of Bab el Mandeb). 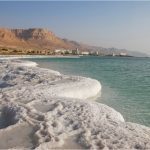 Aside from the wind surges across the Red Sea, winds are usually highest during the late morning and afternoon hours and then lower overnight during the late spring through autumn months. Also, outside of surge events, winds are generally onshore by day and offshore by night 2-3 nautical miles from the Arabian and African coasts. During the summer months, NW winds persist within the Persian Gulf and these winds are generally in the Force 3-5 range, though can be gusty in particular in the afternoon/early evening at peak heating. Typical seas build to a general NW 3-5ft range in the southern part of the region. Fronts have little, if any success making it into the gulf so the stronger surges are far less likely. Likewise, winds and seas within the Strait of Hormuz and the Gulf of Oman tend lower during the summer time. The exception to this is as one begins to move toward the e’rn/s’rn gulf of Oman as we will discuss in a moment. In the Strait of Hormuz, seas are often 2ft or less, with the exception during any surges of northerlies in the Persian Gulf. In the Gulf of Oman, winds near shore tend to be dominated by land/sea breeze interactions. As you move farther south and east toward the Arabian sea, the effects of the summertime Southwest Monsoon Season are far more evident. Here, S-SW of Force 6-7 and seas building to 5-8ft as one gets into the e’rn Gulf of Oman during this time of year. 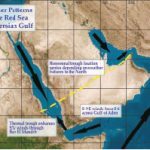 Currents within the both the Red Sea and the Persian Gulf tend to be relatively weak, generally not exceeding 0.3-0.4 knots at any given time. Further, currents are often governed by local wind conditions. 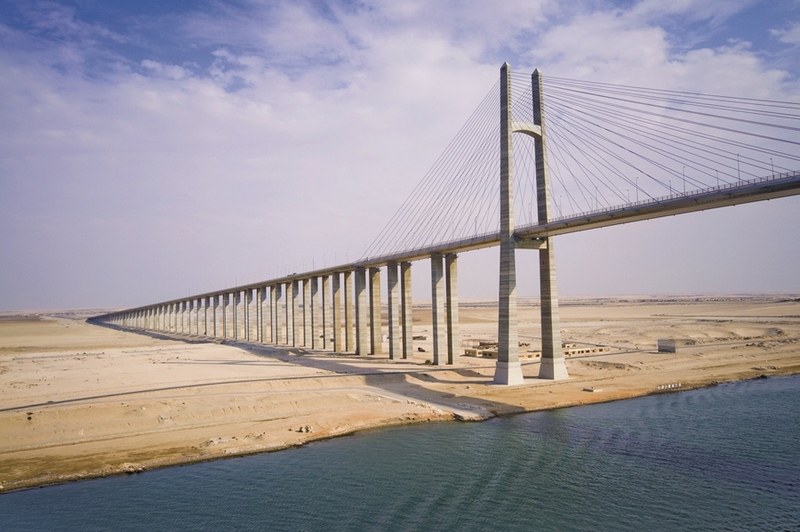 Due to the relatively high evaporation rate within both oceans, in particular during the winter season, there does tend to be a net movement of water into the Red Sea thru Bab El Mandeb and thru the Strait of Hormuz.